Some people who are running Windows have been toying with the idea of running Linux for quite some time. If you are one of those people then the easiest and safest way to try Linux out for the first time is to use a virtual machine. In this guide I will show you how to install Linux Mint as a virtual machine in 5 easy steps. Windows 7 and 8 come pre-installed with the ability to create virtual machines but the software isn’t as good as Oracle’s Virtualbox software. It doesn’t matter which version of Windows you are running the instructions are virtually the same. We will start with the only exception in this guide. 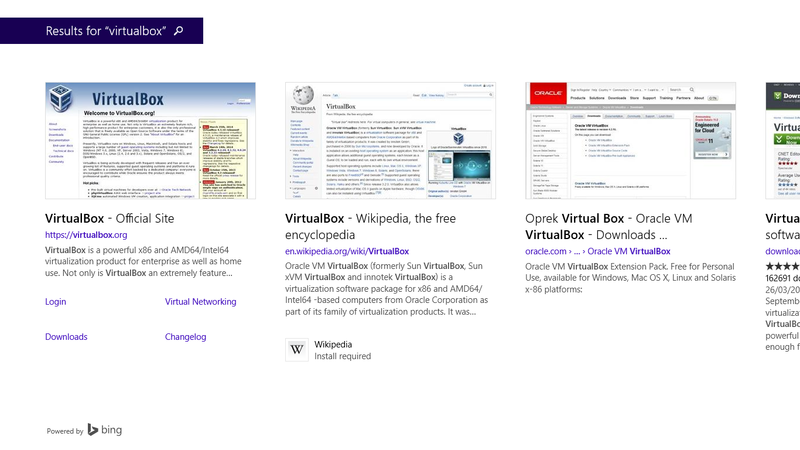 If you are running Windows 8 or Windows 8.1 click on the search icon and type VirtualBox. Click on the first link and you will see a page similar to the one above. Now click on the link for the official site. If you are using any other version of Windows visit https://virtualbox.org. When you get to the Virtualbox website click on the “Downloads” link. Finally, once you get to the downloads page click on the link for the Windows hosts. (x86/amd64). Before we start the actual installation we will kick off step 2 as it will take a while. The current version of Linux Mint is version 16. To get Linux Mint 16 visit http://www.linuxmint.com/download.php. If you have a new and modern computer then click on the link for Cinnamon. If you have a 64-bit computer click on the 64-bit link otherwise click the 32-bit link. If after following this guide you decide that Cinnamon isn’t your thing then try again but go for the KDE version. If you have an older computer then click on the link for MATE. Again if you have a 64-bit computer click on the 64-bit link otherwise click the 32-bit link. If after following this guide you decide that MATE isn’t your thing then try out the XFCE version. The download of the Linux Mint ISO should start and depending on your speed can take some time. Whilst this is going on continue to step 3. To start the installer double click on the executable that you downloaded from the Oracle website. You will be presented with a welcome screen. The second screen asks you what you actually want to install and gives a number of different options. Personally I think it is best to leave the default selections in place. Simply click “Next” to continue. You will now be asked what icons you want to create to enable you to launch Virtualbox. When checked, the first option puts a shortcut on the desktop. The middle checkbox, when selected, puts an icon on the quick launch bar when you press the “Start” button. The third option associates file types with Virtualbox. You will now be shown a warning stating that your network connection will be dropped and reconnected. You are now at the point where you are ready to install Virtualbox. Simply click “Install” and let it do its stuff. To run Virtualbox leave the checkbox ticked that says “Start Oracle VM Virtualbox 4.3.10 after installation” and click “Finish”. If you already closed that window then double click the Virtualbox icon on the desktop. In the past to install Linux Mint within Virtualbox you needed to install Linux Mint and then install something called guest additions. From Linux Mint 16 onwards you no longer need to do this. You can simply create a Linux Mint virtual machine and it will work for you straight away. Click “New” on the toolbar to create a new virtual machine. The first thing to do is give your virtual machine a name. You also need to select the type of the machine. Linux is a good choice. For the version select “Linux 2.6 / 3.x”. If you have a 32-bit computer choose 32-bit otherwise choose 64-bit. The next step requires you to specify how much memory you want to give to the virtual machine. How much you give will depend on how much physical memory you have on your host computer. You cannot give all of your memory over to the virtual machine because you must leave some for the host operating system to be able to continue working. Realistically you need at least 512 megabytes of RAM to run Linux Mint but ideally at least 1 gigabyte or more. The more you have the better your experience will be. If you only have a computer with 1 gigabyte of RAM or less to start with I recommend trying Linux Mint out as a live USB and not in a virtual machine. Select the amount of memory you wish to give to the virtual machine and click “Next”. You are now asked whether you wish to create a hard drive. A hard drive in a virtual machine is just an area from the free space on your physical hard drive set aside to be used by the guest operating system. If you choose not to have a hard drive then you will be running a live version of Linux within a virtual machine. There is little point in doing this. You may as run an actual live version. Select the “Create a virtual hard drive now” and press “Create”. You are now presented with the confusing hard drive file type selection screen. VDI files are the main file type for virtual hard drives within Virtual Box. VHD files are used by Microsoft’s virtualisation software. For a full list describing the file types click here. Select “VDI” and click “Next”. Now you can choose whether you want to have a dynamically allocated hard drive or a fixed hard drive. A dynamic drive will only use the space it needs and grows as required whereas a fixed drive allocates all the space straight away. Fixed disks are faster in the long run but take more time to create in the first place. It is up to you which you choose. You will now be given a slider which lets you choose how big the virtual hard drive will be. Ideally you will allocate at least 20 gigabytes but it really depends how much disk space you have in the first place. I think the minimum you can allocate is 5 gigabytes. Select an amount appropriate to your needs and click “Create”. Now that you have created your virtual machine you need to install Linux Mint into it. To start the process click on the virtual machine you have created and click “Start”. Click on the folder icon and navigate to your downloads folder and select the Linux Mint ISO file downloaded in step 2. You will now see Linux Mint boot for the first time. The image you see at this point will be different depending on whether you installed the Cinnamon, KDE, XFCE or MATE version. The look and feel is generally the same though. Double click on the install icon. The first thing you need to do is choose the language you wish to use to install Linux Mint. Unless you have a reason to make life difficult for yourself I would choose the language that comes naturally to you. You will now be provided with a health check showing how prepared you are for installing Linux Mint. Basically if you have enough memory, your computer is plugged in and you have a network connection you are fine to carry on. You are now presented with a screen asking where you want to install Linux Mint. Remember this is a virtual machine with a virtual hard drive so you can’t do any damage to your host system. Normally I like to choose “something else” and partition the drive myself but as it is a virtual machine I recommend selecting the “Erase disk and install Linux Mint” option. In the following screen select your timezone by clicking your location on the map. The next screen asks you to select your keyboard layout. Choose your layout and then click “Continue”. Create a default user by entering your name and enter a name for your computer. Enter a username and password. (and confirm it). You can choose whether to log in automatically or to require the user to log in using their credentials. The installer will now copy all the files across, install the system and set up Linux Mint using the settings you have specified. Go and make yourself a cup of coffee and come back in around 15 minutes. That is it. You have done it. You have created a virtual machine with Linux Mint. You will receive a message asking you whether you want to continue using the live mode or whether you want to restart now. There is very little value in continuing with the live version. Click “Restart Now”. To start a virtual machine all you have to do is open virtual box using the desktop icon. Click on the virtual machine you created and click “Start”. When you boot up for the first time you will be asked to log in (unless you specified to login automatically). Click on the username and enter the password you specified in the setup screen to continue. Linux Mint will now appear and you will see a welcome message in the centre of the screen with useful links to do with the project. To view the virtual machine in full screen mode click the right CTRL key and F.
To expand the virtual machine across your screen click the right CTRL key and G.
To get back to a windowed view click the right CTRL key and F again. You can do anything in the virtual machine that you would have been able to do if you had installed it directly on your computer. I recommend playing, experimenting, installing software, try it out to the maximum and in a month’s time you will be able to decide when Linux Mint 17 comes out whether you are ready to go full time Linux or not. good tutorial, just what i needed! Great! Works perfectly. But how do I use my USB port? See in the bottom right corner of the screen (when in windowed mode) there are little symbols for cds, usb drives etc. click on the usb drive. Quick question – trying to install Virtual box on Win 7 Pro 64-bit. After installation, when I try to add a Linux machine, I am only shown 32 bit options, and I would like to install 64-bit Mint. Suggestions? Very good tutorial and I'll definitely try this out.. One question though.. if I click "Erase disk and Install Linux Mint" that would mean that the partition where i put the Linux Installer will be wiped out ? or no? because I only have 2 partitions and I plan to put it on the partition where I put my files which is basically Drive D because Drive C is the default, like where we put the OS for windows.. Thanks in advance for you reply. If you do it in a virtual machine the only disk being wiped is the virtual disk which should be empty anyway. It will not affect your actual hard drive at all or any partitions on it. @Michael. Exact same scenario and result. "enable PAE/NX in settings/system/processor." This solved it for me. The only options for linux that appear to me are 32 bit options. Any suggestion? I'm running a 64 bit machine. I will look into this and get back to you. Have you tried selecting other linux as an option? Already sorted it out. I had to go into BIOS and enable virtualisation. After that the 64-bit options were also displayed. Thanks for the tutorial. Sorry if this is a daft question but, should I wish to uninstall Virtual Box and thus the Linux installation, will this mean that the hard drive space and memory allocation automatically go back to Windows, or does the computer only allocate it when you are running Virtual Box anyway? Delete the 'vdi' file associated with your virtualbox. That is where the Linux system is stored. Depending on how big your Linux 'drive' was will be the size of that file. It can be GBs in size. When you delete the vdi file is when the Linux installation will really be removed. Uninstalling Virtalbox won't do that. In fact, you could reinstall Virtualbox and set up a new VM pointing to the existing file to 'restore' the Linux installation. But after you delete that vdi file, then it's gone. "You are now presented with a screen asking where you want to install Linux Mint. Remember this is a virtual machine with a virtual hard drive so you can't do any damage to your host system. Normally I like to choose "something else" and partition the drive myself but as it is a virtual machine I recommend selecting the "Erase disk and install Linux Mint" option." what does it mean..what shuld we do not to harm our drive? which option? If you are using virtualbox and following the instructions above you can choose the erase disk and install linux mint option. I have WIndows7 32 bit as a host OS in C drive. and i have installed the Virtualbox in D drive and installed CentOS 6 in virtual box as a guest OS. After installing the Guest Additions in CentOS and set the Drg n Drop-Bidirectional. it permits to create shared folder in CentOS but i am not able to drag n drop to any file from host to guest and vice versa. please suggest how to copy the file from Host OS to guest OS and vice versa. and how to use share folder. Linux Mint Cinnamon 32-bit didn't work for me as guest OS using VirtualBox 4.3.22 on host Windows XP Home. Didn't get any of the installation options shown above. Got a plain screen with a Mint logo instead. When I press Enter got a short list of choices, none of which worked. I conclude that Mint is useless. Stuff should just work! Oh goodness that was such a helpful tutorial. Thank you!! Very helpful and instructions are so clear,thank you very much! Hi – thanks for the tutorial I wanted to add one more step I had to follow. After installing Mint in VM, i rebooted and it kept loading from the ISO file (i was still seeing the install mint screen). You need to go to the VirtualBox settings and change the boot order to start with hard drive first, so that it launches from the already installed version of mint. Point 5. After I have selected linux mint, it runs a boot sequence but doesn't bring up the desktop. Running on a fairly old mac. Any thoughts? trying to install mint cinnamon in virtualbox. After the 'erase disk and install linux mint' option and install now, I am asked if I want to keep the partitions, I say yeas and the install hangs. Very good instructions. The bit about erasing the disk was a little scary, but it is just the vm, so all was OK. Linux Mint installed and works, and my Win7 box is just fine. Thanks. Why doesn't this tutorial include the Extension Pack or the Guest Additions? Both are essential for running your VM well. On my Windows 10 machine, the download link to the latest version gives an iso not an exe. If I burn the iso and try to install it, the DVD boots and then hangs. Great How To. I ran into a problem after "Selecting a Start-Up Disk". I see the typical screen that says, Linux Mint will start up in 10s. Once it starts it goes blank, and then I get this: ACPI PCC probe failed. Followed by a lot of U with a ^ above it. Then a bit later it stops after writing this: (initramfs) mount: mounting /dev/loop0 on //filesystem.squashfs failed: Invalid argument. Followed by a row of U's again, then Can not mount /dev/loop0 (cdrom/casper/filesystem.squashfs) on //filesystem.squashfs. I have a 64-bit ASUS 2-in-1 PC with removeable touch screen with Windows 8.1 installed. Any suggestions? I think I solved my own problem. I was trying to install LinuxMint 17.3. It worked fine as a Live CD on my machine, but no matter what I tried would not install into VB. I went to distrowatch.com and then noticed that 17.3 has a beta experimental grub, so I looked for LinuxMint 17.2. That installed fine. I'll just use Update to get it up to date.